Never Hear ‘I Forgot…’ Again! It’s that common excuse that you hear from parents all the time. No matter how many emails and flyers you send them, they’ll still forget the date and time for your school event, field trip, or parents’ night out. 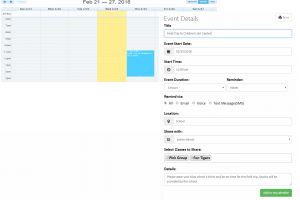 But all of that will fade away once you take advantage of WithMyLittleOne’s powerful calendar system. 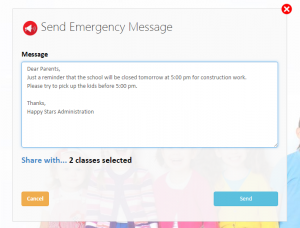 As a school administrator, you can create events and share them with parents in seconds–then set up SMS text, email, or automated phone reminders that greatly increase parents’ participation and attendance. 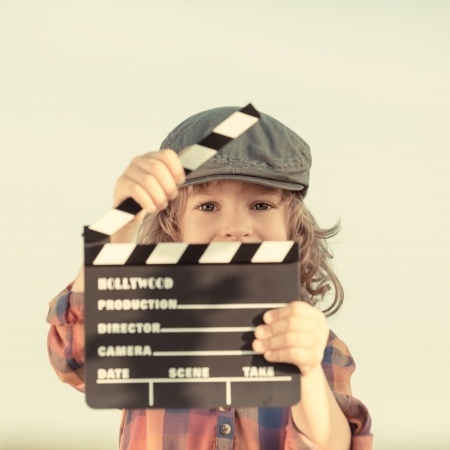 Reach Out to All Parents With the Push of a Button! Real-time emergencies and time-sensitive situations, such as last-minute schedule changes, might not be happening on a daily basis. Yet when you do need to disburse info quickly, you need to feel you have a secure and reliable solution at your fingertips! Send instant messages right from your mobile admin console or the web console. Instantly reach out to the entire school or selected classes. Send a blast through all communication channels or select a combination of SMS texts, automated voice calls, and emails. View and respond to all emails right from your admin console. Design beautiful HTML emails from templates and send them to all parents, selected groups, or individual recipients. Manage multiple school and class emails all in one central location. Easily choose who receives your email with quick access to class and parent contact lists. This one-of-a-kind email interface gives you the ability to quickly share forms, pictures, and notes with parents. 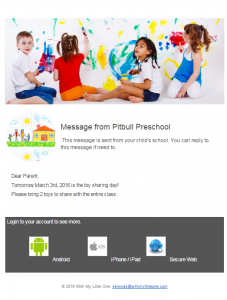 The most amazing part of WithMyLittleOne’s email module is the intelligent recipient box, which makes it easier than ever to send messages to the entire school, selected classes, selected parents, or anyone outside your school database.